One of the very first cakes I ever made for a friend was a Star cake. It was also one of my very first posts and consisted of two sentences and one photo. Having decided I needed a blog I really had no idea what I was going to do or how. I am still working on that! I tend to look back on a lot of the cakes I do and see things I wish I had done differently but even though it’s not perfect I am still very proud of my original star cake. I think it was the point at which I thought maybe I could make decent cakes after all. 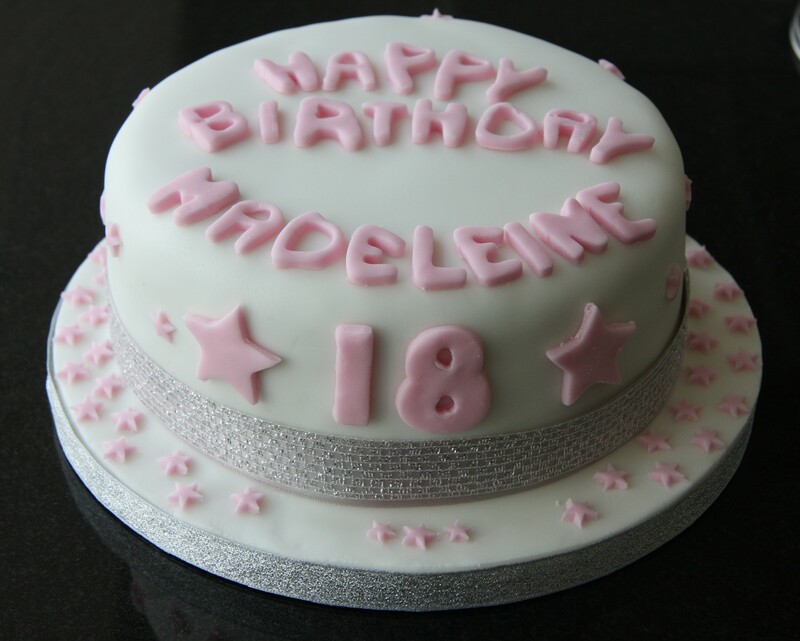 My friend Kate asked me to make this one for her daughter Madeleine’s 18th birthday. Kate and I have spent a lot of time together recently in the cold and wet: either watching our 9 year old sons play rugby, hockey or football, or at Boot Camp. This term I am looking forward to Boot Camp without having to wear ear warmers and two pairs of gloves, and spending some time watching the boys play cricket in the sun. And by that I mean chatting and eating match tea. 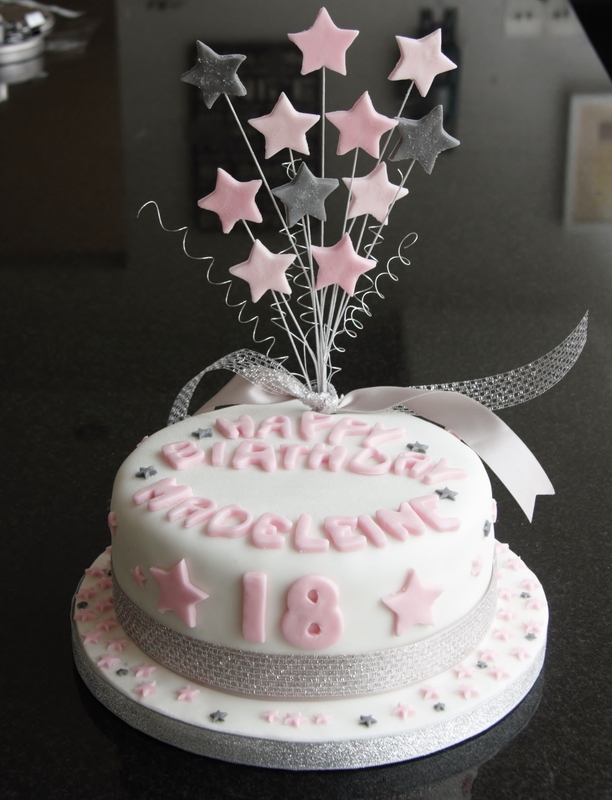 I made a topper with floristry wires and sugarpaste stars in grey and two shades of pink with a dusting of glittery sugar. I usually dip the floristry wire in water to use as a glue for the sugarpaste but used edible glue this time and was amazed at how much better it works. I made some extra stars for the cupcakes as well. 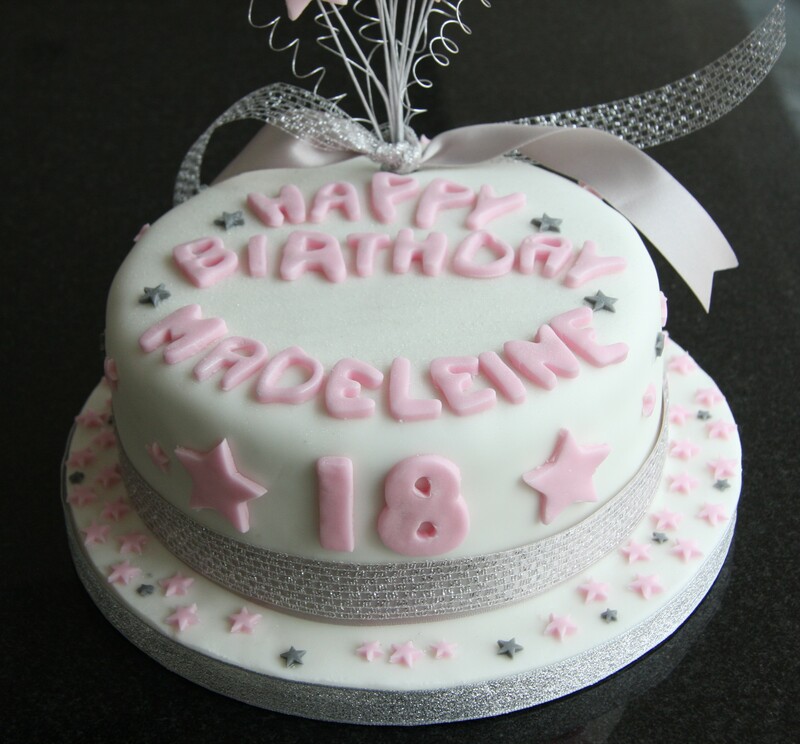 I did the main decorations on the cake in pink on the white background. And then added a few silver stars as well as some twirly bits and the rest of the ribbon at the base of the topper. I wanted the cupcakes to “match” but as they were all chocolate with chocolate buttercream and the cake was on a white background it was a little difficult. I used my favourite silver cases and white, pink and silver decorations. 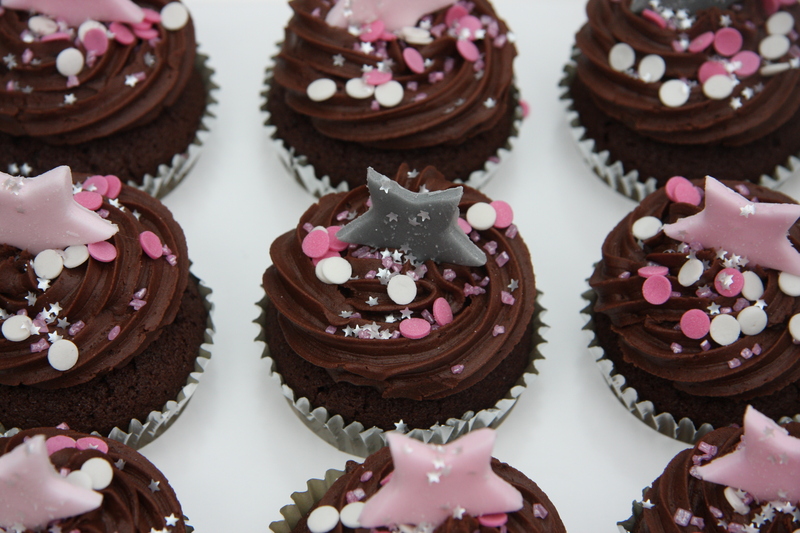 The cupcake toppers were the same stars as for the cake and again I used silver and two shades of pink. 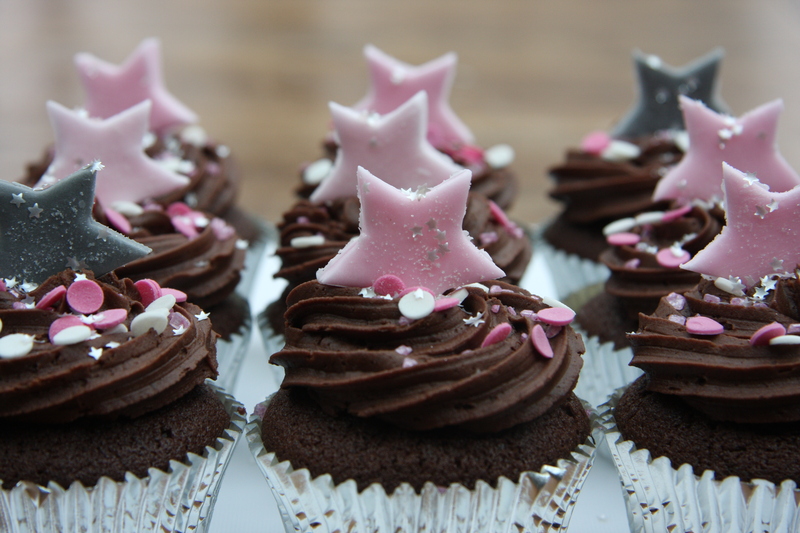 I love the teeny silver stars: they were the last thing to go on and I think they look really good stuck to the sugarpaste stars. 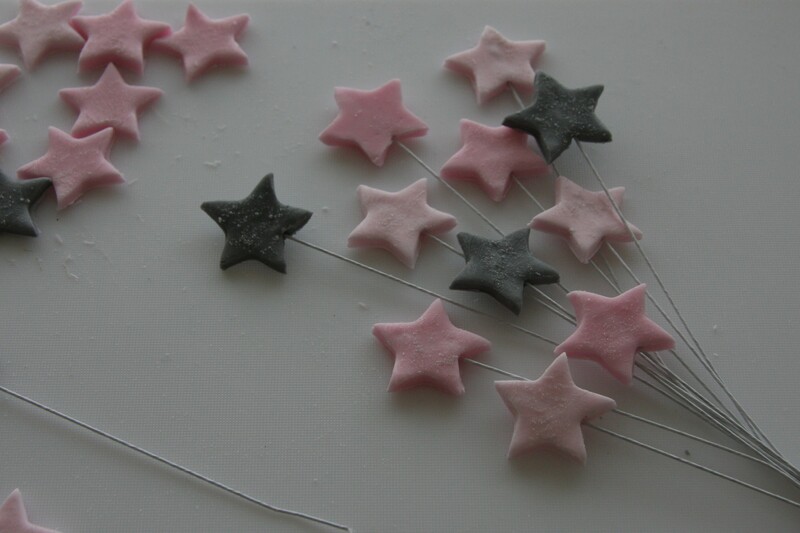 I was lucky they stuck: next time I will make sure the sugarpaste stars get a sprinkling of tiny stars while they are still lying flat. I love these! You did a fantastic job. 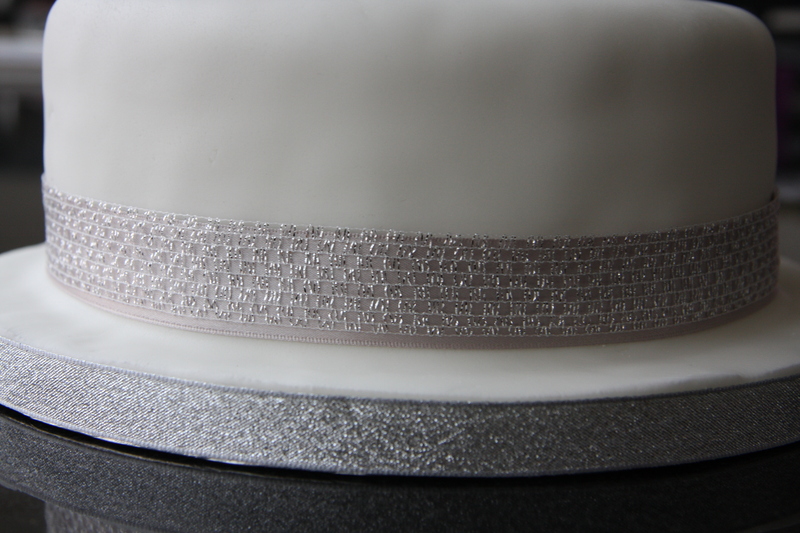 It’s not easy to make all that fondant looks so smooth and sharp! Thank you very much – I’m definitely improving with practice but sometimes it just seems easier than others! I am so pleased that you share more stories on your blog now. I love reading about the story behind the cake. The cake looks beautiful and the cupcakes make me want to sit down with a cup of coffee and enjoy! I can almost smell the chocolate. I agree the tiny silver stars are really pretty. Yum ! Thank you very much, it’s very much a learning curve!